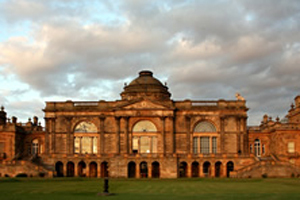 Gosford House, East Lothian: Situated 20 minutes from Edinburgh, Gosford House was featured in The House of Mirth and can be used for conferences, activity days and incentives. The large dining room hosts up to 120 guests for a gala dinner while the two-tier Marble hall caters for up to 400 guests for a larger reception. Culzean Castle, Ayrshire: The Eisenhower Apartments, part of the Castle, offers accommodation and facilities for small board meetings. The venue was featured in The Wicker Man. Kelvingrove Art Gallery and Museum, Glasgow: The building has been recently refurbished and its Great Hall seats up to 500 dining guests and up to 1000 for a drinks reception. It was featured in a recent televison adaptation of The 39 Steps.